Last updated by Joe Spake at March 24, 2017 . And this is a billboard of sorts, advertising Midtown businesses with an artsy touch. Too bad it hasn’t been updated in years, but is still cool looking as well as having a hip Midtown feel. Would you buy an ad on this wall? The I Love Memphis Mural Project has been popular,as well as being a good PR tool for the city. 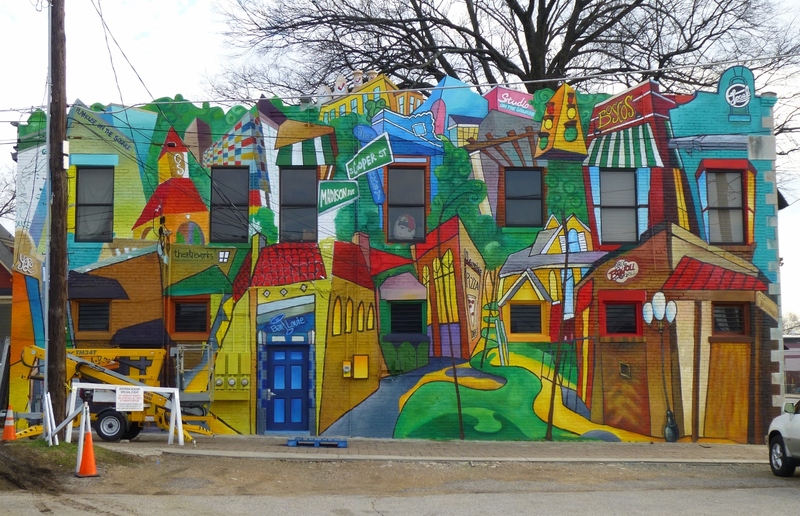 Urban murals are popping up all over the world, and Memphis could use some more. 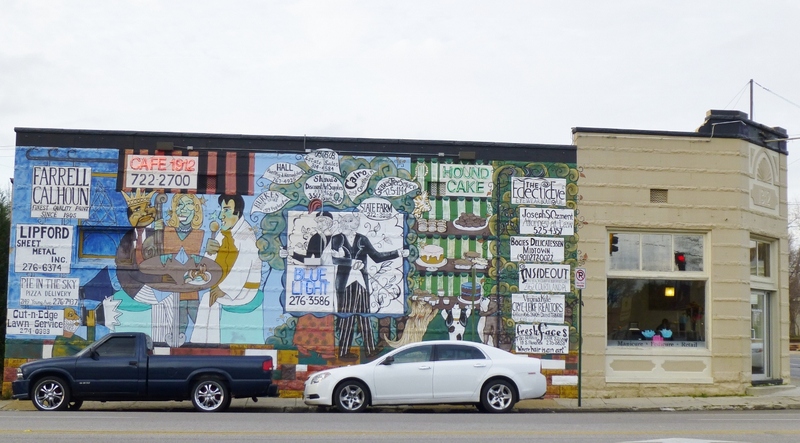 This entry was posted in Culture, Memphis, Photography and tagged Downtown Memphis, Downtown Memphis Commission, Downtown Memphis Tennessee, Mural, Paul Morris on February 23, 2013 by Joe Spake. 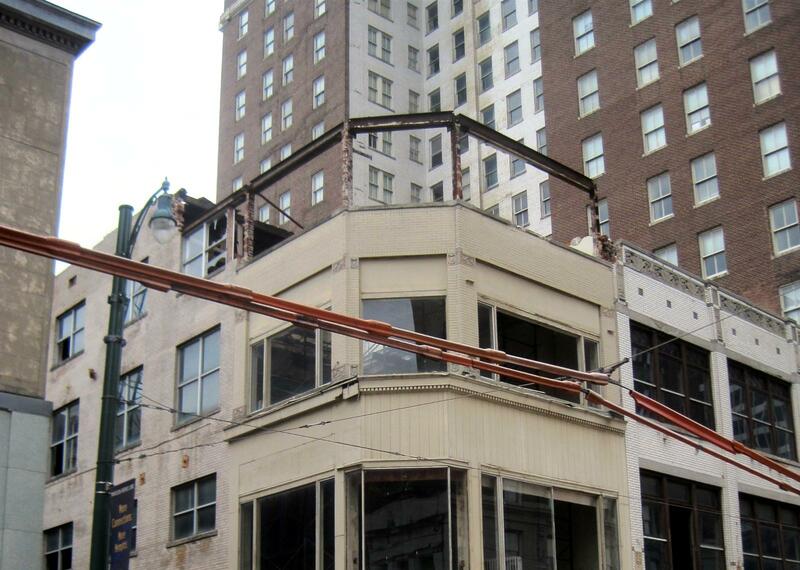 On March 25, 2011, the roof of the neglected building at 118 Madison, in the heart of Downtown Memphis, collapsed, causing the Fire Department to close Madison due to structural issues with the Building. After 4 months, not much progress had been made and I posted In a Real City on 7/5/2011, picking up on a quote from Downtown Memphis Commission President Paul Morris. Here’s the way the building looked then, 4 months after the collapse. When I posted again about the building in August, 2011 – In a real city – revisited – still no progress had been made on repairing or demolishing the building. Not wanting to turn this into the Downtown Neglect Blog, I observed but didn’t post about the building again. This entry was posted in Culture, Memphis, Photography and tagged 118 Madison collapse, Downtown Memphis, Downtown Memphis Tennessee, madison, madison avenue on March 7, 2012 by Joe Spake. Everyone who knows me knows that I am not only a board member, but also a huge fan of the Center for Southern Folklore. 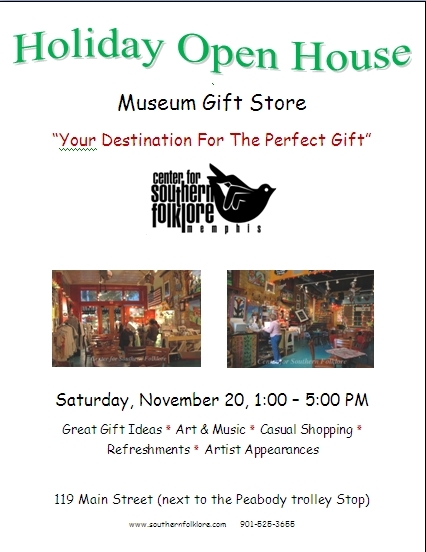 The Folklore Store, at 119 South Main (right by the Peabody Place trolley stop) is having a Holiday Open House this Saturday, November 20, from 1-5 PM, featuring all the cool stuff at the museum store, plus music, artists, refreshment and lots of surprises. If you are looking for truly unique gifts for some of your hard to please friends and relatives, The Folklore Store is the place to be for regional music CDs, Folk Art, books, historic photos, unusual souvenirs, and much, much more. This entry was posted in Culture, Memphis and tagged Center for Southern Folklore, downtown, Downtown Memphis Tennessee, folklore store on November 16, 2010 by Joe Spake.